Most people are not yet thinking about what to serve for holiday dinner this December, but at Beau’s All Natural the planning starts early. 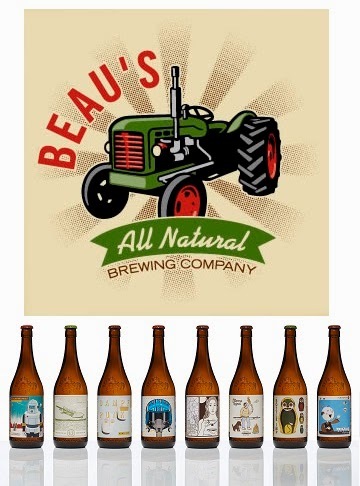 Voting begins today for the third edition of Best of Beau’s: a mixed 4-pack of fan-favourite Beau’s beers to be released for sale in November. This is the third year Beau’s will be letting democracy decide which beers go into the holiday gift pack, which will be available at LCBOs across Ontario, as well as directly from the brewery. Last year’s Best of Beau’s voting saw a total of 1,779 ballots cast to choose the four winning beers: Burnt Rock Vanilla Porter, Doc's Feet Dubbel, Screamin' Beaver Double IPA, and Rudolphus VI Belgian IPA. The selections in the running for 2014 include every beer Beau’s has produced in the last eight years, with the exception of those that are already available year round (Lug Tread and The Tom Green Beer!) and a handful that simply can’t be recreated. Fans will have only a few weeks to vote their favourite Beau’s beer into the mix pack, as the polls will close June 30. Voting can be done online at the Beau’s website, or at the brewery’s retail store in Vankleek Hill. The online ballot for Best of Beau’s can be found at www.beaus.ca/VOTE. Results will be announced in early July.